Oh my! This was amazing. I need to make this again very soon. Chloe loved it too. She loved the bacon, mushrooms and onions the best. The roasted mushrooms and sautéed onions are amazing. The mixture of cheeses make this mac and cheese super awesome amazing. I didn’t end up using the Gruyère cheese, so I just added more parmesan and fontina cheeses. Place mushrooms on a baking sheet, drizzle with olive oil and season with salt and pepper. Roast until browned, about 20-25 minutes. Reserve. Turn oven temperature down to 350°F. Cook the bacon in a large skillet over medium-high heat until crispy. Drain on paper towels, leaving 1 Tablespoon of bacon fat in the skillet. Chop the bacon and reserve. In the same skillet with the bacon fat, cook the onions over medium-low heat. Stir occasionally until light brown, about 15 minutes. Reserve. Melt the butter in a large pot over medium heat. Whisk in flour and cook for about a minute. Whisk in the milk and cook for about 4 minutes until thick and bubbly. Whisk in the half-and-half, 1 teaspoon salt and ½ teaspoon pepper. Temper in the eggs by adding a ladle of the sauce into a bowl with the eggs. Mix with a fork while adding the sauce. Pour the eggs into the sauce while whisking. Stir the parmesan, Gruyere, fontina and goat cheeses into the sauce to melt. Fold in the cooked macaroni until coated with the cheese sauce. Butter a 9 x 13 inch casserole dish. 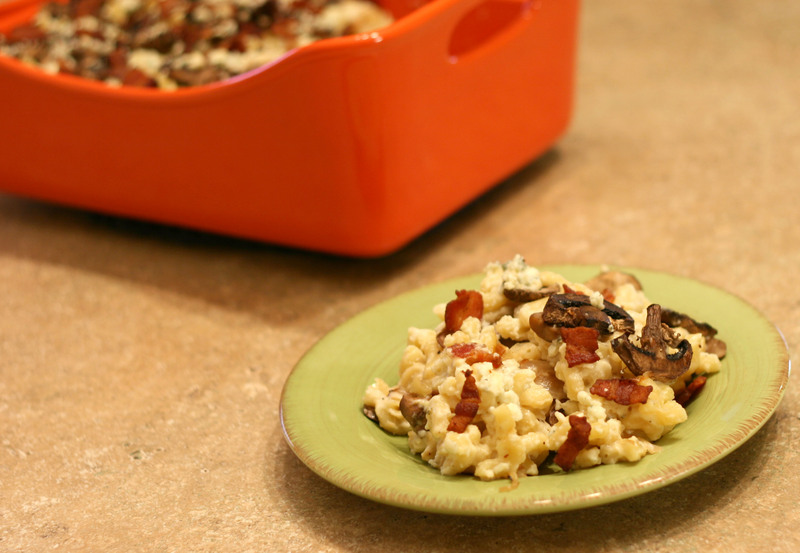 Layer in half the onions, half the macaroni, half the mushrooms, half the Gorgonzola, and half the bacon. Repeat these layers. Bake until bubbly, about 20-25 minutes.